After 10 full days in the Phillipines, Shana and I are both very anxious and excited for this plane to leave Clark airport outside Manila and take us to the land of smiles, Siam sunsets, and coconut curries. I really enjoyed scuba diving the Japanese WWII wrecks and exploring the lagoons and lakes on Coron Islands but I think we could have done Basuanga Island in less time. Shana has had a hard time eating vegetarian here as Filipinos love their chicken, fish, and pork so we are both looking forward to the veggie friendly Thai cuisine. 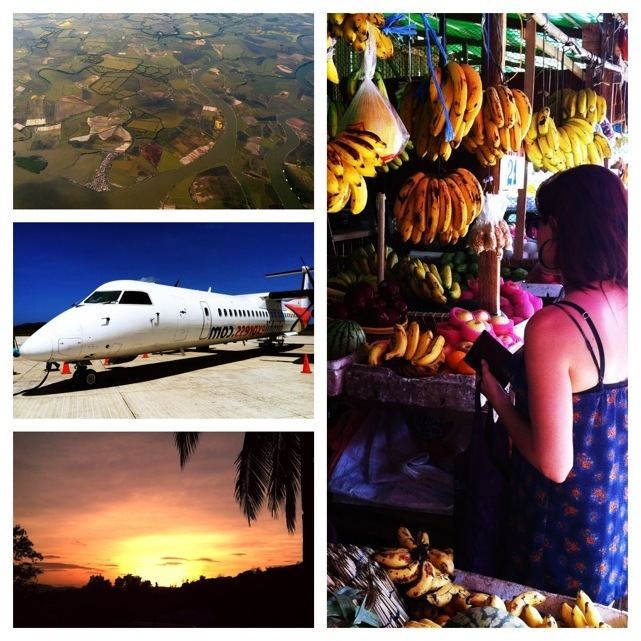 Yesterday we left Basuanga Island and took a flight to Manila. From there we had to make our way to Angeles City about 90 minutes north of Manila where our flight to Bangkok left today. Angeles city is home to Clark Air Force base, a huge sprawling airport that once housed the US Air Force during the Vietnam war. During the late 60’s, Angeles City developed a nightlife scene to cater to the needs of the many Americans and Australians stationed there. From what I’ve heard, very little has changed and during our short time there it felt like were in the middle of a giant brothel. The hotel we stayed at was full of Australian, British, and American ex-pats and their young Philippina lady friends. Looking through a weekly tourist guide, it seemed like the small city had developed a decent sized community of permanent and seasonal expats. Ads offering houses for sale and rent, visas, cheap medical services, and the latest girly bars filled the pages and made me feel a bit gross and sad for these men. What were they escaping from back home? Were they lonely widowers who hadn’t found a wife or partner in their country of origin? Were they stationed here in the Vietnam War and never could acclimate returning home? Was there a shameful legal past they were running from? All of these questions raced through our mind as we watched solitary sad looking men between the ages of 50-80 years old sipping drinks at bars and paired up with girls half their age. It was easy to be judgmental of these men and I wished that I could hear their life stories and learn what had brought them here. There was a fine line going on between prostitution and what may have been actual loving relationships. The entire place was a documentary film waiting to happen, although I can’t say that I could stay there long enough to film it. Needless to say, Shana and I stuck out there like sore thumbs. To be fair, very similar places exist all over Asia and in Thailand like Pattaya and the Patpong district in Bangkok. However, this place really struck me due to the ex-army backgrounds of most of the men. When we arrive in Bangkok, we will be starting preparation for some videos we are producing while there and lining up interviews. It is a great city to act as a hub for our travels, due to it’s proximity to most South East Asian countries, modern amenities, availability of most everything we may need from clothes to film supplies, and access to internet connections. I have spent more time in Bangkok than any other city I have not permanently lived in, and am so excited to visit my favorite restaurants, food stalls, and stores. We look forward to sharing our stories, photos and videos of this amazing country in the coming weeks.